UN Minorities Forum: Will it do any good? 1. Because of the need for pre-prepared interventions, there seemed to be hardly any interaction at all between participants at the forum proper. This could be contrasted with the quickfire brainstorming session at the Side Event organised by MRG which dealt specifically with the plight of minority women. There, the interactive discussions made everything seem much more energised. Perhaps, in future Forums, some thought could be given to mixing up the sessions so that there are also smaller working group sessions on specific solution driven topics. The guaranteeing of minority rights is but a manifestation of the rule of law, and the cornerstone of human rights norms which essentially seek to ensure a recognition that all of us are created equal under the law and are entitled to the equal protection of the law. The rule of law (or sovereignty of the law) is of course one of the 5 guiding principles of Malaysia’s “national ideology” set out in the Rukunegara. It is noteworthy that Article 8 of the Malaysian Federal Constitution (guaranteeing equality under the law) was recently held by the Federal Court (Malaysia’s highest court) in Sivarasa Rasiah v Malaysian Bar (2009) as an “all pervading” protection within the Malaysian Constitution requiring all executive, legislative and judicial action to be “objectively fair”. Given the current Malaysian government’s 1Malaysia policy, it seems inevitable that we should see in the near future measures to effectively end unlawful discrimination and ensure the equal treatment under the law of all those living in Malaysia. So … will it help? Although not what I expected, the Forum and the eventual recommendations that come from it, promise to be a useful addition in the development of international human rights norms aimed at creating more equality for those who suffer discrimination as a result of their nationality, ethnicity, religion or linguistic background. The recommendations that will be made by the independent expert on minority issues will be useful as a basis for assessing how far governments have gone in ensuring that all people within their body are treated with equal respect under the law in their participation in the political process. Personally, although I would have preferred to have been able to speak and interact more, I felt that my attendance at the Forum was a rewarding and enriching experience. My first experience of the United Nations, and of the Palais des Nations in Geneva, was inspirational. 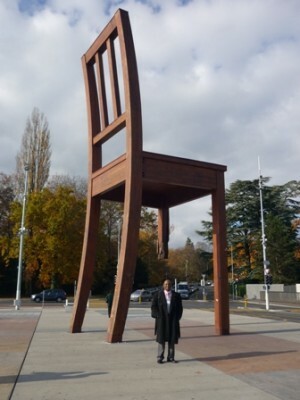 The monuments to world peace dotted around Geneva (such as the Broken Chair sculpture pictured above) reminded us of the atrocities that the United Nations is meant to deter, and melted even my cynical heart a little bit. I trust the forum’s recommendations will help to bring about positive change in reinforcing the notion that all of us are created equal.